Left to right: Patrick, John, Dolan Beth, Marshall, Andrew, and Peter. Andrew was the baby crying in the movie. It was a magical reunion with Beth Grant. We exchanged stories about how Marie Rowe (The casting director) changed all of our lives... for the better. We are all so bonded that we feel like family and it was delightful and memorable to get together again. Beth has just completed filming in El Reno... the movie is 'Great Plains' and is set to be released later early next year. I can't wait to see it. Galen Culver filmed it and it will air it on "Is This a Great State of What" ... Channel 4 at 5:00 tomorrow Oct 12. 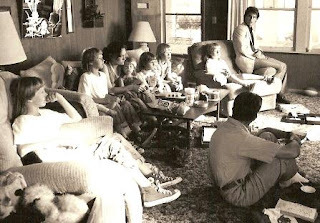 Left to Right: Marshall, Dolan, Beth, Andrew on her lap, Peter, Patrick, John, and Tom Cruise.